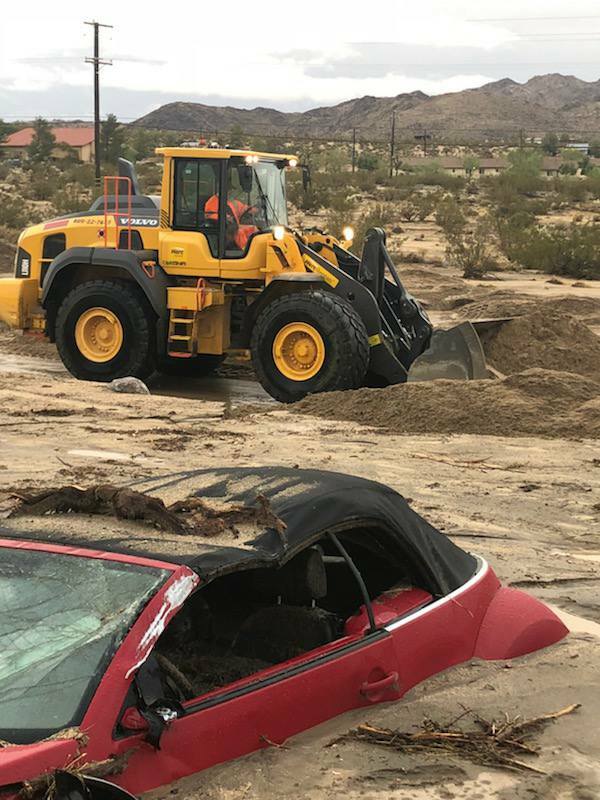 A storm that surprised everyone with its intensity and duration brought havoc to the Morongo Basin Friday night and Saturday. 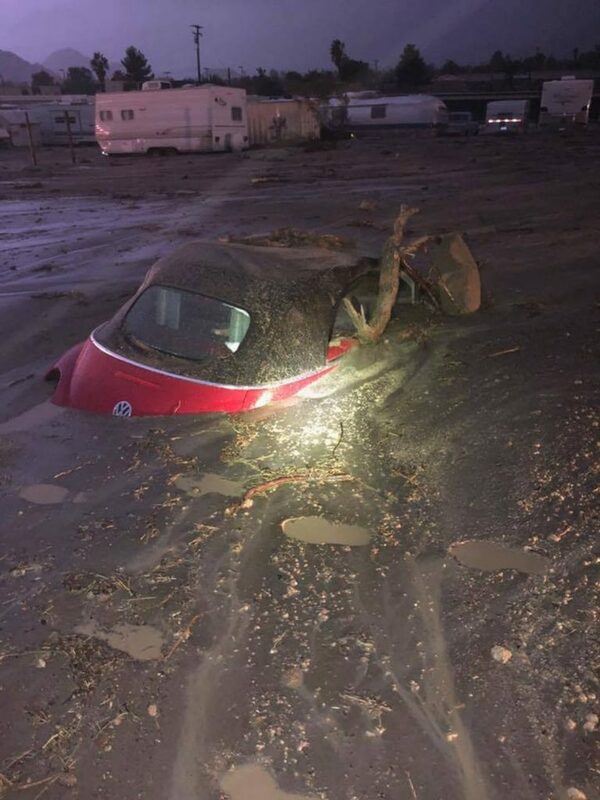 Thunder, lightning, rain, and hail started about 10:30 p.m. Friday and by 11:15, first responders started getting calls asking for help. 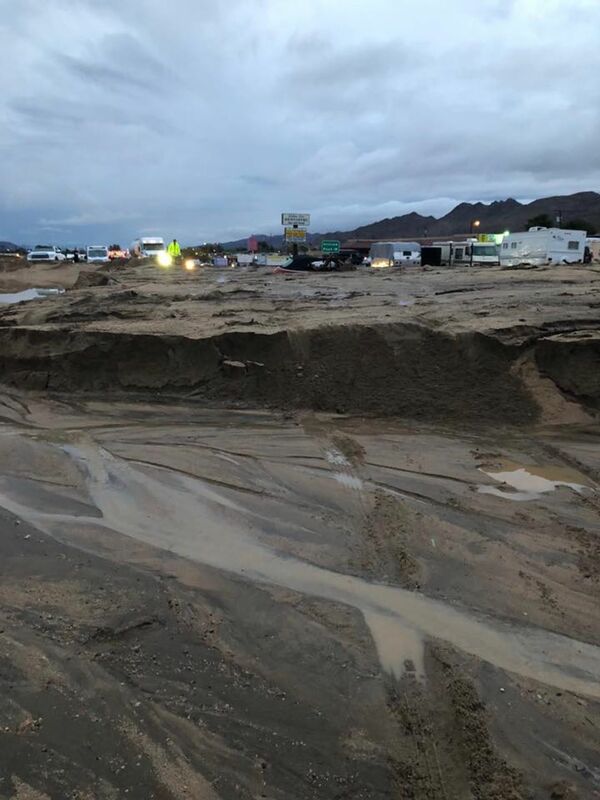 County Fire Battalion Chief Scott Tuttle said firefighters received 13 water-related calls: from motorists who were stranded in flash flooding and mud flows on the highway; residents whose houses were being inundated with water; and concerning washed out roads. One of the first calls for help was at 11:30 p.m. Friday at Hillview and Highway 62 in Joshua Tree for a red Volkswagen Beetle that had become trapped in the mud flow, with mud up to the car’s windows. A Morongo Basin Ambulance sent out on a water rescue also got stuck. Tuttle said all the occupants from all the stranded vehicles managed to get out safely. 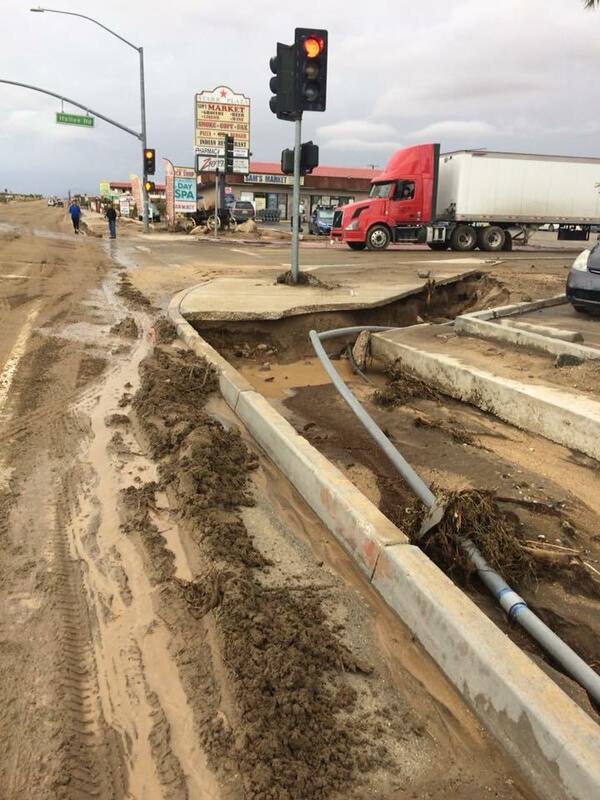 Highway 62 was covered with mud and debris up to four to five deep near Hallee Road. 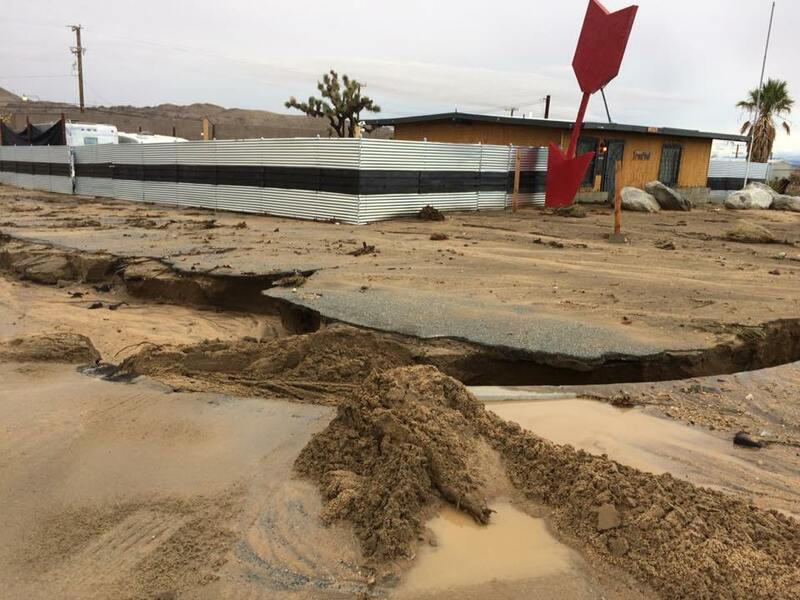 The California Highway Patrol shut down Highway 62 in Joshua Tree about midnight due to the flash flooding, and the highway remained closed well into Saturday as Caltrans brought in a skip loader to move the mud off the highway. Traffic was diverted onto Aberdeen. The Twentynine Palms High School football team, returning from its victorious game against Desert Mirage High School, spent the night at Denny’s Restaurant before moving to the Yucca Valley High School multi-purpose room for breakfast. 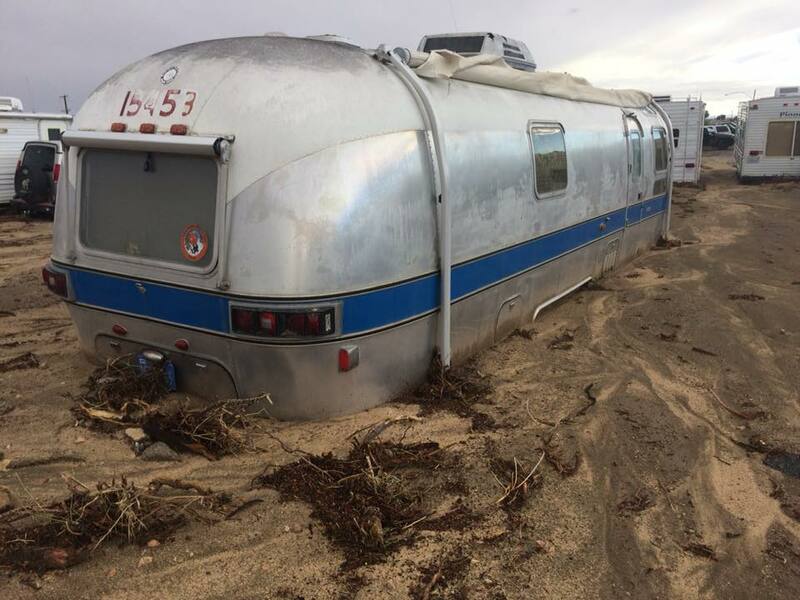 More than 2,300 customers of Southern California Edison were without power Friday night and Saturday due to the storm, and some residents were without water. 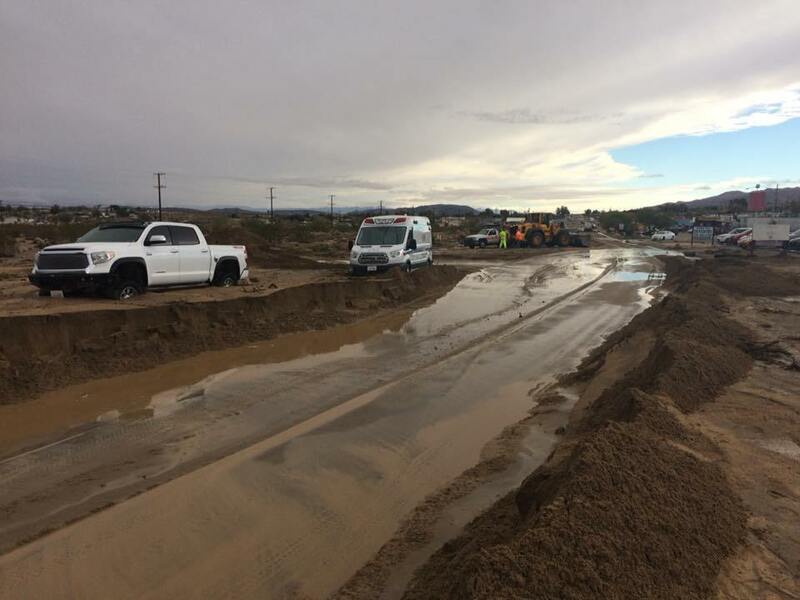 Tuttle reminded residents to “turn around, don’t drown.” Don’t attempt to drive through flowing water, as there’s no way to know if the road may have been washed out, or drive through mud and debris flows. Around Joshua Tree, California has so many military and alien bases all over the Mojave Desert. There is always reason to be happen. 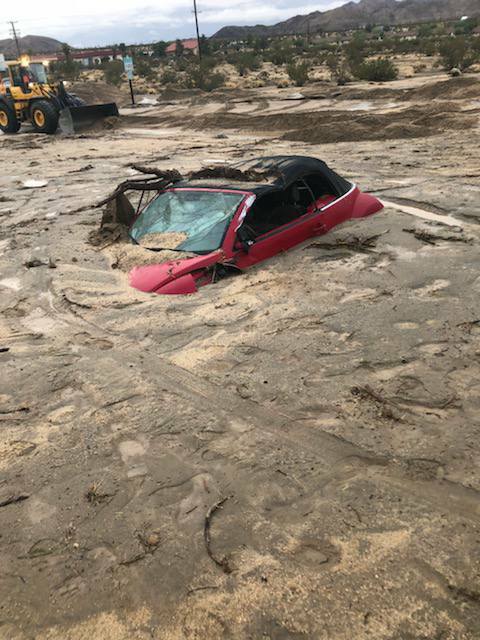 Insult to injury, Reptilian evacuees’ car was exploded in Panama City Beach. 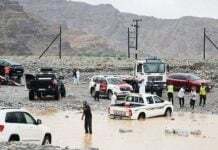 President Trump said “More than 20,000 trucks with full of water and food are coming. 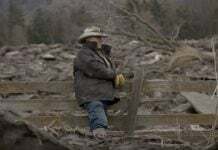 You will get plenty of food.” just after Hurricane Michael passed Panama City area. But those trucks with full of water and food have never come even it has been already 5 days have passed after Hurricane Michael. Fire chief of Panama City got a report that 50% of people had decided to stay in those affected area. Most of people try to ride the storm have been washed out to sea? ~Earth Changes~ | HILINA SLUMP. 🌊 is coming! Do you remember some christian guy got a vision from GOD. Something big might happen to California by October 16, 2018. He was even weeping and said “I do not want to people to die. Please evacuate from California by 11~12th of October.” Then look, Helina Slump is sliding! A big tsunami might be coming! 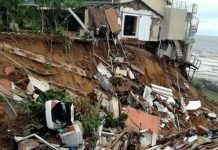 Many earthquakes bombarded around Helina Slump this year. Soon or later, it will slide. The big question is whether the big slide will happen this week? Galactic Federation of Light will destroy all the satellites operated by Reptilian Military Space Agencies. I used to have a satellite internet service charged me $160 month, and even it was not unlimited. It was only 50 gigabytes per month. The company Viasat is a part of the Military Industrial Complex where I do not want to contribute my money $160 per month. I know all the satellites are going to be removed soon or later by Galactic Federation of Light. I said “Good bye” to Viasat before their satellites are going to be destroyed. Signal outages are now common and every day life.